The photo on the left shows that the brick wall had settled and pulled away from the building (over many years). This was not only cosmetically undesirable, but also rendered the gate unusable. The gate had broken some of it's mounts and would no longer fit between the brick opening as a result of the settling. I used a hydraulic jack and a safety line to prevent the wall from tipping (I had excavated under the brick, proximal to the building, in order to help the brick wall drop against the building. The photo on the right is the after. After straightening the wall I tucked it tight with mortar and concrete (I had to remove some of the sidewalk bricks to do this). 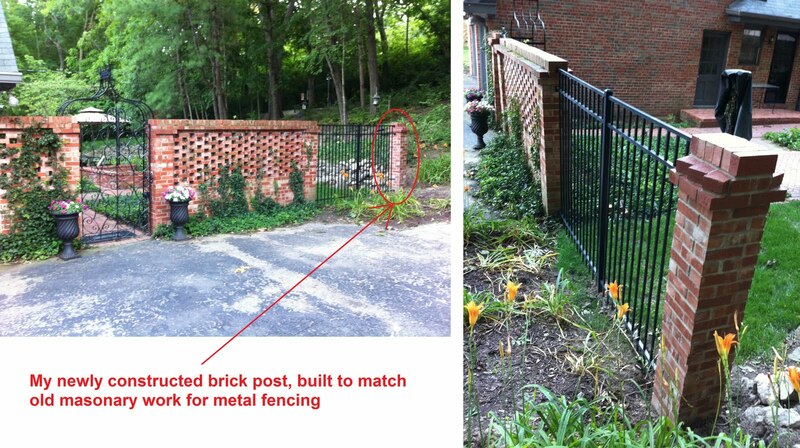 I then later refastened the gate to the brick, sanded and repainted the gate. 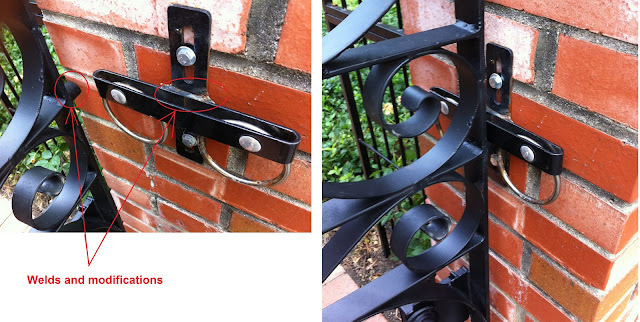 The above photos show the new gate latch. It is a very cool and unique ring latch that allows the gate to open and close from both directions. The rings simply lift as the metal stub that I welded onto the gate passes under it and then falls and holds the gate closed. A simple touch from under the ring lifts it and allows the gate to swing open. I also had to modify the ring latch because it was too thick to fit between the gate and the brick. I cut out an inch of metal and turned the the mounting bracket perpendicular to the ring latch and welded it in place. Here's an example of my brick work. I poured a substantial footing underneath. 12" thick with 4 pier tubes dropping below the frost line (30" here in Columbia, Missouri) and rebar. The bricks are a pretty good match to the old brick work nearby. It is noteworthy to mention that sometimes brick can not be matched closely or at all. This one turned out acceptable.